With each new set, I do a mailbag column or two to answer all your questions about the latest set. It's now Ravnica Allegiance's turn. Some topics I'm not allowed to answer for all sorts of reasons, including previews for future sets. With that out of the way, on with the questions. I'll start with the one I got the most. This was important because we knew we were going to have the Bolas guilds be led by Planeswalkers and we color balance our planeswalkers in Standard. Five is the only number that lets us color balance and half the guilds being influenced by Bolas felt correct. We wanted a sense of things getting worse and Bolas gaining influence over time, and if we went three and then two, it would have felt like things were getting better. Other than that, the Creative team was free to pick and choose whichever guilds made the story work best. Large non-core, Standard-legal sets these days get around two planeswalkers. Five was about as many as we could squeeze in and stay within our quota. Planeswalkers are our main characters, so it seemed cool to use them as leaders of guilds. Flavorfully, it made a lot of sense that Bolas would put Planeswalkers in charge as that's who he most often deals with. Also, flavorfully, with a few exceptions, it doesn't make sense for Planeswalkers to be running the guilds not being taken over by Bolas. Not really. The Bolas influence had more to do with the Planeswalkers and legendary characters, but the essence of the guilds hadn't really changed, and the guild mechanics are more about the nuts and bolts of the guilds, which we wanted to keep constant. In some ways, Ravnica Allegiance has two new Planeswalkers. Let me explain. When the Creative team was figuring out which guilds would be Bolas aligned, they realized that two of the guilds, Azorius and Orzhov, didn't have a Planeswalker from Ravnica. So, they figured out what they needed and then went earlier in the Bolas Arc (one of the perks of planning ahead) and stuck them in. Dovin was a good fit for Kaladesh because they knew that the Consulate was going to be the "bad guy," which needed a face, and he was white-blue. Kaya wasn't a clean fit for any of the Standard-legal sets, so they found a way to work her into Conspiracy: Take the Crown. The reason for seeding them ahead of time is that it would add to the feel of Bolas manipulating things across the Multiverse and require less introduction time for them as there was already so much going on in Ravnica Allegiance. So, yes, we not only considered it, we did it, just not in the way you might have thought. That was mostly story driven, but obviously influenced by our understanding of which characters are more popular. One of the fun things about a return is we get to revisit characters and make new cards for them. That usually influences us to have a decent amount of repeated legendary characters. From a vision design standpoint, Ravnica Allegiance worked like any other set. The Creative team decides what characters are going to be in the set, and then we design cards for them. Sometimes this happens later in the process (during set design), but usually with a return we have a better idea earlier who the characters are going to be. For example, we started Guilds of Ravnica and Ravnica Allegiance vision design knowing all the Planeswalkers and a majority of the legendary characters. Vision Design and Creative have a pretty good flow established. There's a lot of back and forth so that each group is able to make sure that their best ideas are getting incorporated. With an established world like Ravnica, things are a little easier because more of the elements of the world are known. 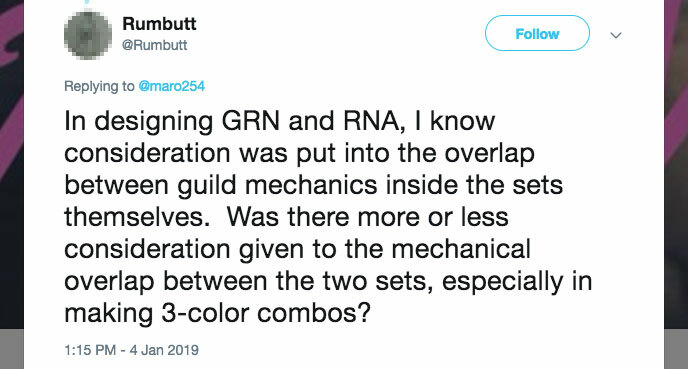 Ravnica Allegiance and Guilds of Ravnica are still considered bottom-up sets because they're structured around a mechanical component—color pairs. The nature of designing a two-color faction set requires a very rigid, cycle-heavy design skeleton. There are individual cards that are designed top-down, like the characters, but most of the heavy weight of vision design is structuring how the various factions parallel one another, a bottom-up exercise. Both the second and third trips to Ravnica used the first trip as the basic model for how the sets were built. One of the byproducts of this is that the sets have a bit of a throwback design feel. In exploratory design, I had some ideas about how we could restructure the guild sets to make them a bit more modern in their design, but as War of the Spark (the May expansion also set on Ravnica) was doing a lot of innovative things, we decided that it would be best to start our return to Ravnica with a more tried-and-true guild model. When the sets were drafted together in original Ravnica block, we did spend some time making sure there was a certain amount of overlap. Once we separated them in Return to Ravnica block, we spent less time on it. Not zero, it is something we thought about usually on a card-by-card basis, especially when designing monocolor cards. What we find is that guild mechanics tend to be a bit simpler and more open-ended so they can work well with the guild mechanics that overlap their colors in their set. This tends to lead them to have a greater chance of working well with other guild mechanics even if we don't spend extra time trying to line them up. For example, Orzhov's afterlife mechanic makes tokens. Selesnya's convoke mechanic plays well with tokens. That wasn't coordinated, but we recognized after the fact that the synergy existed and kept that in mind when designing individual mono-white cards in Ravnica Allegiance. I think you have a little bit of a misunderstanding of how set math works. The way we come up with a number for set size has to do with how many cards we can print on the various sheets we have. For example, the reason a large set has 53 rares and fifteen mythic rares is because we print (mostly) on eleven-by-eleven sheets. Printing each rare twice and each mythic rare once gets us 121 cards, which is exactly the number of card slots on eleven-by-eleven sheets. The Guildgates were on their own sheet because they had their own slot in the booster pack (aka every Guilds of Ravnica and Ravnica Allegiance booster, barring pack-filling wonkiness, has exactly one Guildgate per booster). Us choosing to make two pieces of artwork was just us increasing the visual variety of something that was showing up once per pack. If we hadn't, that sheet would have still been 121 Guildgates with the same ten pictures. No new cards would have been generated. The reason we pulled the basic lands from the boosters, by the way, was because we were trying to help Limited mana fixing. We experimented with a combination of basic lands and Guildgates, but the players who got more Guildgates had too much of an advantage, so we shifted to just having Guildgates. 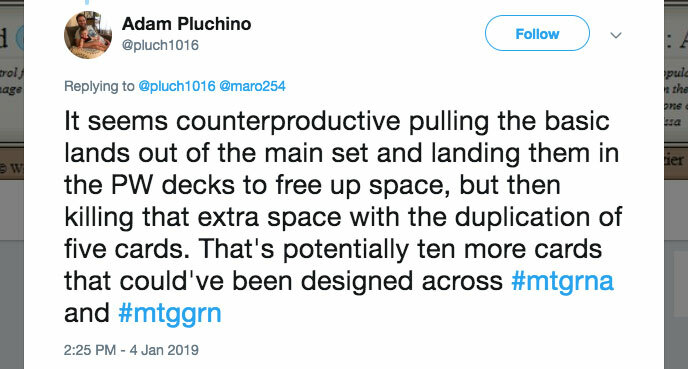 All of this is a long-winded way of saying that removing the extra piece of art from the ten Guildgates would not result in the two sets having ten additional cards. I'm taking "Mutant" to mean "a creature of a single race type that has been genetically modified in some way, but without hybridizing it with another creature type," for example a Bird Mutant or a Merfolk Wizard Mutant. It's a member of its original species, but tweaked, and the addition of "Mutant" signals that tweak. In contrast, a creature of two or more race types hybridized together is clearly already the result of genetic experimentation and doesn't get the Mutant type added on. For example, Shambleshark and Skitter Eel are just Fish Crabs. It's highly unlikely, as we have a rule that we only reference the Commander format in cards made specifically for a Commander product. We've learned over the years that having text that doesn't matter most of the time tends to both cause confusion and warp how players evaluate cards. For example, if you made a 2G 5/5 that gains trample if you have four or more artifacts, many players won't play it in a deck without a lot of artifacts even though a 5/5 for 2G would be very good. Players are not great at ignoring extra text. The only exception we've found is very flavorful trinket text where it makes the card holistically feel cooler even if it isn't adding a lot of mechanical advantage (things like "protection from Dragons"). Unfortunately, "can be your commander" doesn't fit that requirement. The events of Ravnica Allegiance happen slightly after the events of Guilds of Ravnica. For instance, the last story spotlight in Guilds of Ravnica occurs before the first story spotlight of Ravnica Allegiance. A while back we looked at the market research of all the mechanics and tried to figure out if there was any connection between the ones that scored well. We approached the problem from many different angles and came up with two answers. Players like mechanics that are powerful and that offered them a choice (and those two things are most likely correlated). When players like something, we usually do more of it. Many years ago, I went to an interesting talk at the Great Developers Conference (a big convention for game designers—it's where I gave my "Twenty Years, Twenty Lessons" speech back in 2016—read articles Part 1, Part 2, and Part 3, or watch the video) and saw a presentation on fun. It talked a lot about how fun is derived from people facing a problem and then being given the tools to solve that problem. One of the tools the presenter talked about was giving players choices so that they feel ownership in the solution when they solve the problem. Magic games tend to be more dynamic and enjoyable if they don't play out the same every time. Having a series of choices allows the player to take different paths and increases the chance that the game doesn't play out identically. Interestingly, R&D thinks about this backward from you. If we could come up with a solid mechanical underpinning for each of the ten guilds, we would. The ones that tend to work the best are the ones where there is a strong mechanical theme that we can keep coming back to. Having Simic able to connect to +1/+1 counters is a feature of the guild, not a bug. We'll make other sets that have green-blue archetypes (such as Ixalan's Merfolk), and those sets can do different things. We want Simic to feel Simic-y, and a big part of that is having all the Simic cards from various sets play well with one another. The strong mechanical foundation is a big tool in helping us do that. Evergreen mechanics can ebb and flow in their usage. Sometimes, they tie in perfectly with what sets are doing and get ramped up. Other times, they conflict and get ramped down. For example, fight is a red and green mechanic. Gruul is a guild all about fighting. The overlap between those two things just pushes us to up the number of fight cards we make. As always, the pendulum swings, and things will change, so if you're a fight fan, enjoy the current environment. If not, don't worry, it won't last forever. Ravnica sets always make us have to choose between creating ten-card cycles and creating five-card cycles. The former helps worldbuilding, while the latter is more about giving the individual set some definition. Usually, we err toward the former over the latter, as players tend to expect ten-card cycles on Ravnica. The lockets are the kind of cycle we always finish because it's part of the mana fixing. The goal is to make sure that all ten guilds have equal access to the same mana sources, so this isn't the kind of cycle we'd limit to just five cards. That's all the time I have for answering questions today. I got enough good ones that I'll be back next week to answer more. As always, I'm eager to get your feedback on today's column, including your thoughts on any of the answers I gave. You can email me or contact me through any of my social media accounts (Twitter, Tumblr, Instagram, and Google+). Join me next week as I answer more questions. Until then, may you play more Ravnica Allegiance to come up with even more questions.